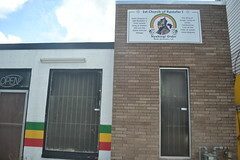 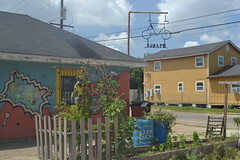 After breakfast at the Who Dat Coffee Cafe, I was already in the general vicinity of the Lower 9th Ward, so I decided to drive around that area and see if there was anything worthy of being photographed, and actually there was a lot. 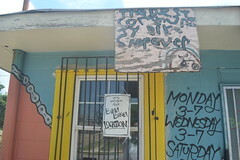 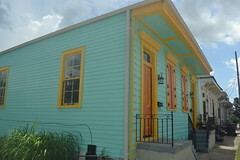 Of course, the Lower 9th Ward had been devastated by the flooding of Hurricane Katrina. 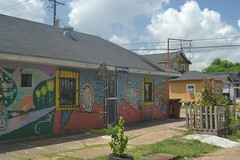 Cut off from the rest of New Orleans by the Industrial Canal, the neighborhood is surrounded by water on three sides, and for many years was the home of two notorious housing projects, the Florida Projects and the Desire Projects, the latter of which was once said to be the largest public housing project in America. 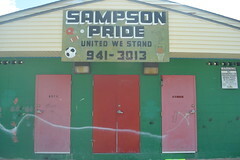 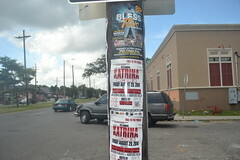 Both projects were wrecked by Katrina, and neither were rebuilt, at least not as housing projects. 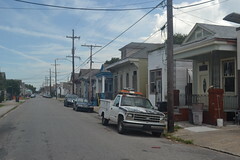 Mixed income developments are being built on the site. 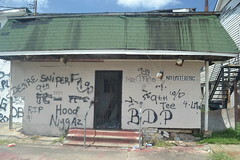 Business areas in the northern portion of the neighborhood were also devastated, and since people have not returned in large numbers, none of these shopping centers have been rebuilt. 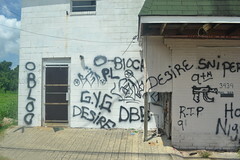 They are still ruins, covered with gang graffiti. 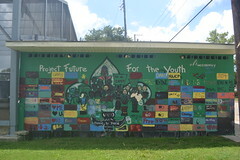 But nearby, at a playground called Sampson Park, I came upon a beautiful mural done by something called “Project Future for the Youth”, containing a lot of wonderful and inspiring slogans and quotes, presumably painted and conceived by young people from the neighborhood, possibly even before the storm. 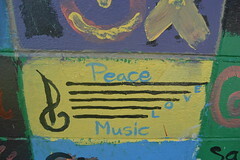 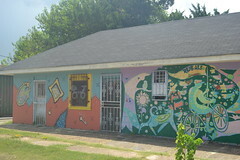 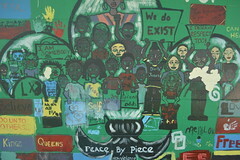 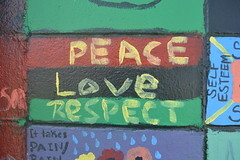 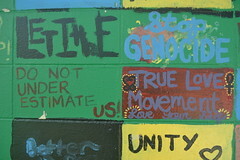 The various tiles within the mural call for peace and an end to violence, and emphasize brotherhood, peace and even music. 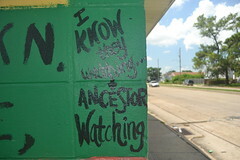 One section of the mural states, poignantly, “I know they watching…Ancestors watching.” Perhaps nothing more accurately sums up the unique culture of New Orleans, particularly the city’s Black neighborhoods…traditions that have died out in many other cities last years longer in New Orleans, perhaps because the young people know they are being watched by those who have gone on before. 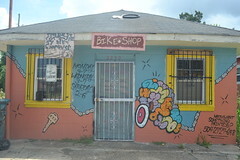 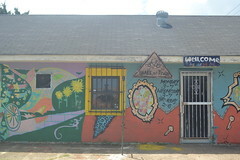 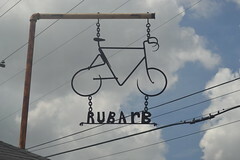 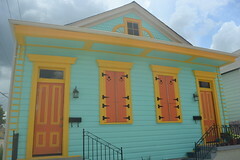 In another part of the neighborhood was an attractively colorful building which proved to be a bike shop. 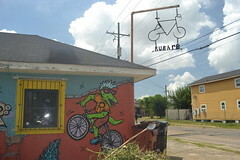 All kids love bikes, but bikes are not just for kids in New Orleans, which is a bike-friendly city in the extreme. 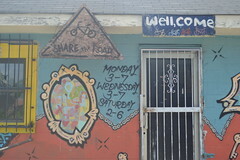 Young people in inner-city neighborhoods even have customized bikes, sometimes rigged with lighting and sound systems. 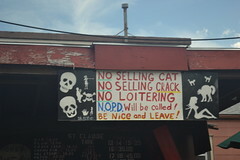 Down on Claiborne Avenue, I came across a tire shop that has evidently had a problem with neighborhood crime, and decided to deal with it through a blunt sign: “No cat selling, No crack selling, No loitering…NOPD Will Be Called.” It’s hard to imagine anyone trying to sell drugs or love at the neighborhood tire shop, but evidently someone did. 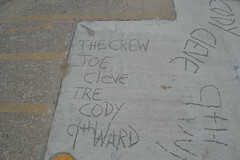 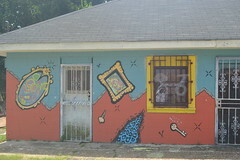 Nearby, a recently poured sidewalk gave a group of 9th Ward kids an opportunity to immortalize their names in concrete. 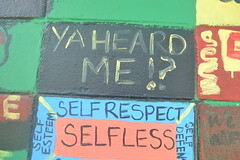 They listed their names along with their ward, and the designation “The Crew”. 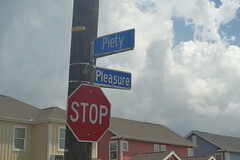 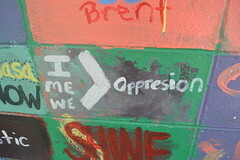 Here’s hoping that they and their peers in the 9th Ward have a bright future ahead.